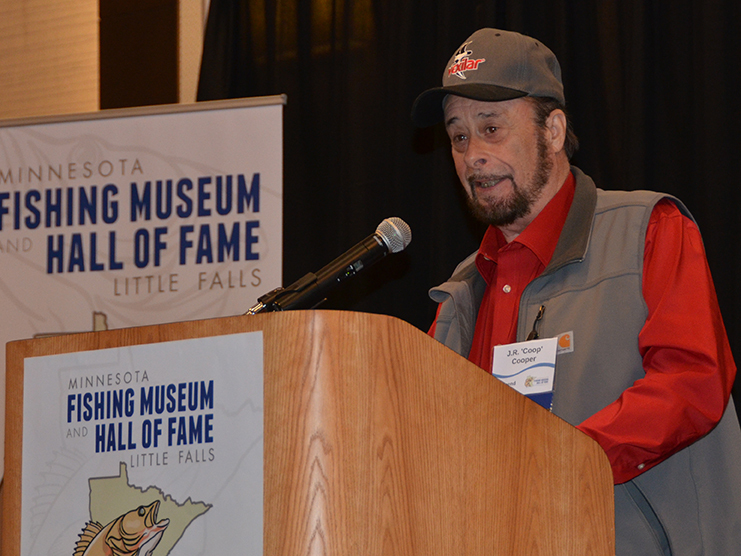 Year after year, the crowd for the Minnesota Fishing Hall of Fame annual induction ceremony grows larger. Held this morning at the Millennium Hotel in Minneapolis, the 2019 event coincided with the Northwest Sportshow at the Minneapolis Convention Center next door. 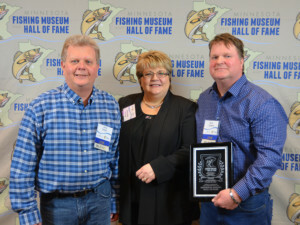 More than 200 past inductees, friends and family of new inductees, and representatives of the state’s fishing industry were on hand as the Little Falls-based Hall inducted four individuals and two businesses. Bemidji-area guide and educator Bryan “Beef” Sathre emceed the event. 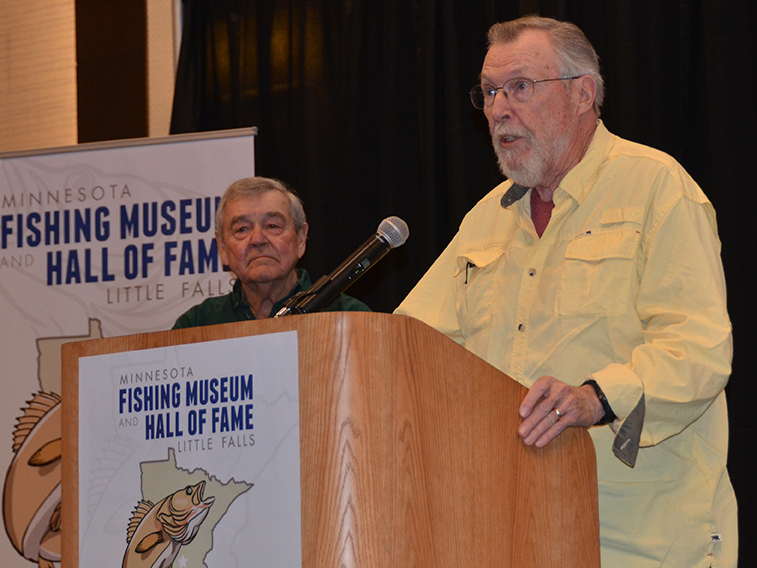 Royal Karels (at the podium) and Marv Koep inducted legendary central Minnesota fishing guide Harry Van Doren, who passed away in 1980. Marv Koep and Royal Karels inducted legendary central Minnesota fishing guide Harry Van Doren, who passed away in 1980. Van Doren began his nearly six decades of guiding at age 11, on the 1920 bass opener at Lake Edward, where his family homesteaded and built the lake’s first resort. As Joe Fellegy outlined in a recent story on Van Doren in Outdoor News, he would eventually mentor an impressive array of Minnesota greats such as Gary Roach and Al and Ron Lindner. Koep, a Minnesota fishing legend in his own right, called Van Doren an innovative standout angler and guide and credited him with having a huge effect on the sport of fishing in Minnesota and beyond. “Harry taught me everything I know about walleye fishing,” Koep said. Family owned and operated every day of its existence, Vados Bait and Tackle was purchased by Greg Fisher and Eric Stokes in June 2000. The godfather of modern ice fishing, Dave Genz, inducted Vados Bait and Tackle, a north metro bait shop that has been in business since 1947. Family owned and operated every day of its existence, the bait and tackle shop was purchased by Greg Fisher and Eric Stokes in June 2000. The shop has been selling live bait and tackle in the Twin Cities for more than 60 years and has been in its current location since 1950. “Vados always has strived to be the ‘Best in Baits from the land of lakes.’ They wanted the best selection and the best quality live bait on the planet,” Genz said. 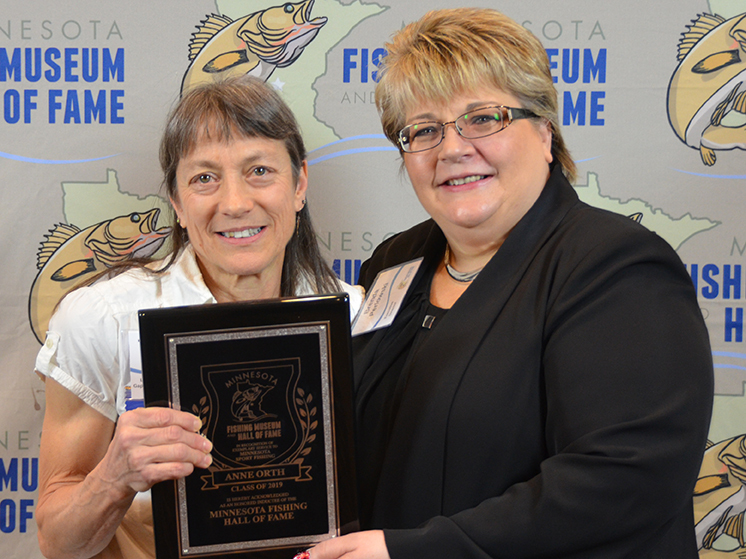 WAM President Kristen Merwin and founding member (and fishing author) Sybil Smith accepted the recognition on behalf of the organization. 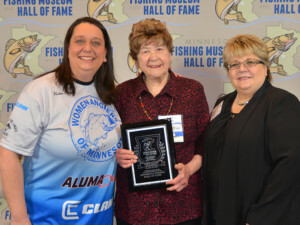 The Women Anglers of Minnesota brought a large group of members who cheered repeatedly during the organization’s induction. Formed in 1977, WAM launched among a group of women who wanted to create a peer group for women to fish and gather together. 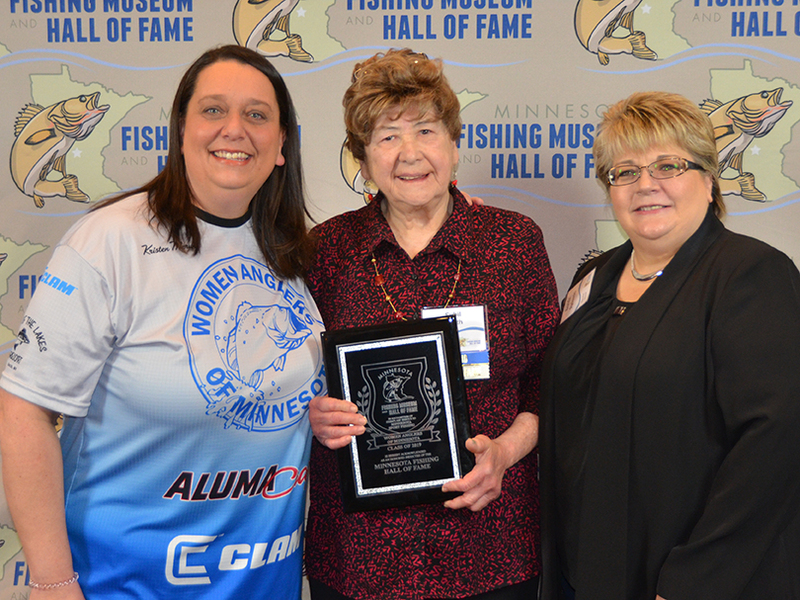 The club was formed with a purpose to educate, empower and support women learning the sport of angling. Since its formation, women have joined and supported the mission to teach other women and children how to fish, and to further cement the future of fishing in the state of Minnesota. 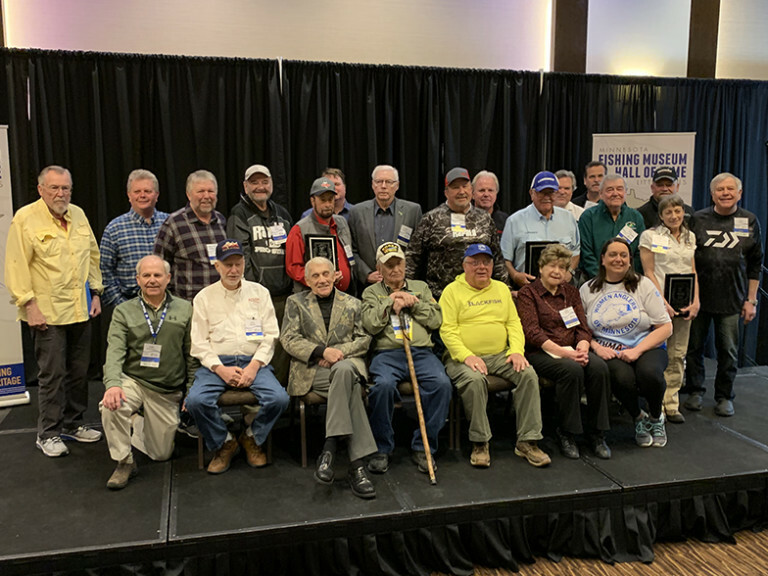 In his speech introducing the 600-member-strong organization, Matt Johnson of Clam Outdoors noted that most WAM members have introduced boys and men to fishing. In his acceptance speech, Cooper thanked his family and emphasized indoctrinating the next generation in the sport of fishing. “I’ll try and keep my end of the bargain and keep on teaching people, and I invite any young person out there to contact me to chat about tactics and fishing,” he told the crowd. “Mr. 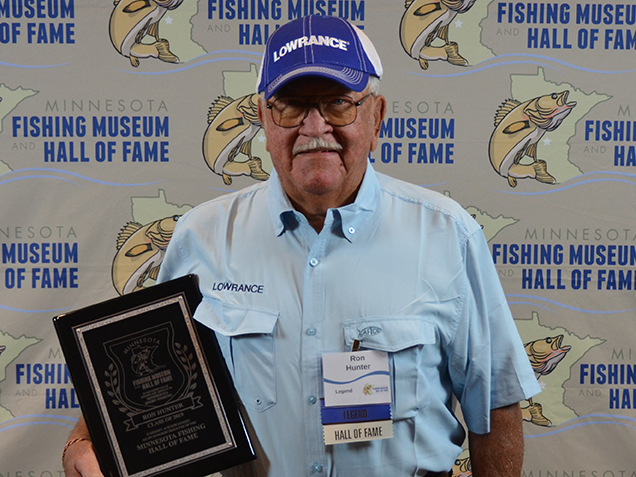 Walleye” Gary Roach gave an introductory speech for his friend, Ron Hunter, who has been a fixture on Lake Winnibigoshish for more than 40 years. Longtime owner of Judd’s Resort on the north-central Minnesota lake, Hunter also has vast knowledge of the resources in the region and years of experience on the water. Dan Gapen of the Gapen Company drew lots of laughs as he recounted hiring Anne Orth to work for his company more than 30 years ago. He considers Orth one of the most experienced, informed female outdoor sportspersons in America and commended her photography skills and voiceover work on his DVDs. “Bobber” Anne, as she’s known within the fishing community, has fished extensively throughout North and South America, boating trophy northern pike, lake trout, salmon, Arctic grayling, bass, tarpon, billfish and the giant catfish of Venezuela. Along the way, she’s picked up a couple of saltwater fishing records. She also gives seminars to kids at sports shows on how to fish and is a frequent guest on numerous radio shows. 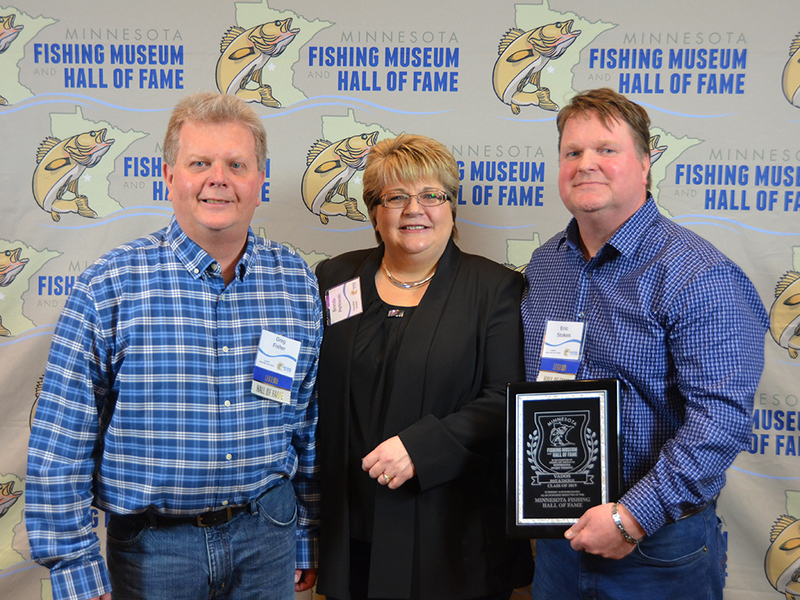 Other notes from this morning’s event included an update on finding a permanent home for the Minnesota Fishing Hall of Fame. Brenda Perlowski, assistant director of the Hall, said that legislation is moving through the State Capitol to potentially find a facility that would also house the Minnesota Military Museum. Also, John Peterson, a founder of Northland Tackle, gave an update on the Minnesota Fishing Coalition. 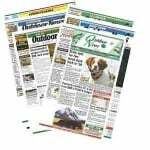 See Rob Drieslein’s column in the March 29 print edition of Minnesota Outdoor News for more details on the Coalition.